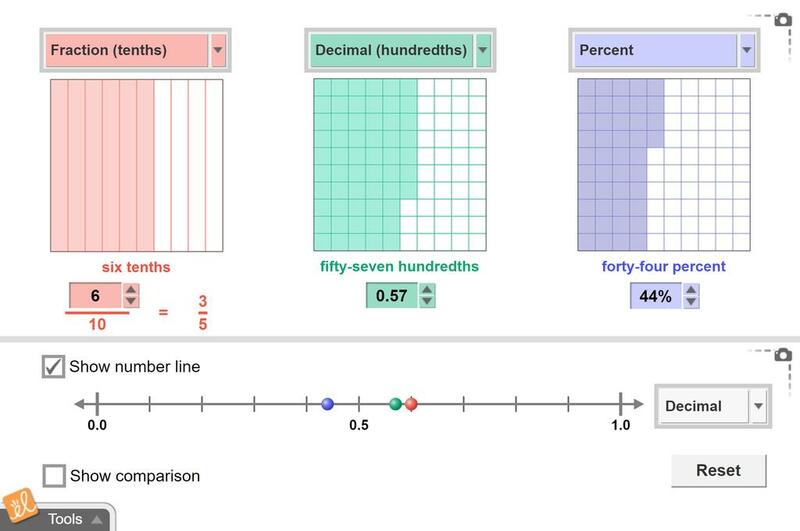 Compare fractions, decimals, and percents. Define percent as "out of 100." Understand that fractions, decimals, and percents are alternate methods of representing the same quantity. Express a quantity, such as 46 out of 100, as a fraction, decimal, and percent. Know that a percent is a decimal (in hundredths), equivalent to a fraction out of 100. I adapted some of the lesson to have more building activity prior to getting on to gizmo. I added two as... (more)sessments to the lesson. Here is a really simple lesson from the Fraction, Decimal, Percent Gizmo. I changed it a little to accom... (more)adate my lower level students. I also added a few more materials as an aide. I used this Gizmo lesson and changed it to adapt to my lower level achieving students. I also added a fe... (more)w more learning manipulatives along with what the Gizmo program recommended. This gizmo allows students to apply previous learning and knowledge to another way of understanding fractions, decimals, and percent. I feel that this is a great way to teach students about decimals, percents, and fractions. It allows students to browse and compare.